The content of this page is based on Prison Architect Version 1.8. Show the sources of Contraband, and all recently recovered contraband in your prison. Also shows your Confidential Informants and their information. The Intelligence view has to be unlocked by researching Intelligence from the Bureaucracy tree of the Chief. It then provides an overview over the possible and actual sources of contraband in your prison and other confidential information. The Dangers view simply provides an overlay for every room to list the contraband possibly to be found there (e.g. for a canteen: knife, fork, spoon), and lists those contrabands' properties (e.g. for the knife: Weapons, Tools, Metal), so you can plan security measures. Besides, it displays estimated values for the current supply and demand of the different contraband types (weapons, tools, narcotics and luxuries) and the approximate prices for contraband trading (in a simplified scale: "$" for cheap, "$$" for medium, "$$$" for expensive) if you hover over the categories in the supply/demand window. The -24 Hours and -7 Days views provide an overlay that displays all the contraband found in your prison in the last day or week respectively. 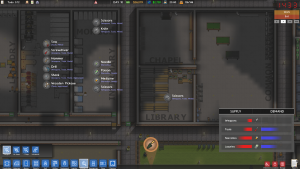 The contraband is displayed on the map and when hovering over it, a tooltip will give information what it is, at which prisoner it was found, how he got it (e.g. "Smuggled in by Prisoner" or "Stolen in Infirmary") and when it was found. Additionally, the route it took will be displayed in the map, highlighting the stations where it came in, where it was hidden and where and how it was detected. This view highlights where exactly the recently found contraband was stolen from or smuggled in. The Informants view allows seeing the information gathered by Confidential Informants. It also allows you to recruit or activate them and gives an overview of your current informants, including their coverage and suspicion levels. Additionally, your current (green) and any potential (yellow) informants are highlighted, as well as gang members and their allegiance. 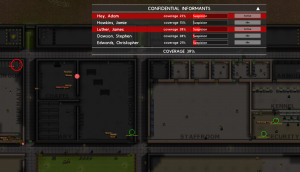 There also is an expandable list of all your current informants, where you can see their current levels of coverage and suspicion and are able to activate or idle them. The accumulated level of coverage by all your active informants is also displayed (note that it does not simply sum up, as there will always be some degree of overlapping). This page was last edited on 20 November 2016, at 13:03.